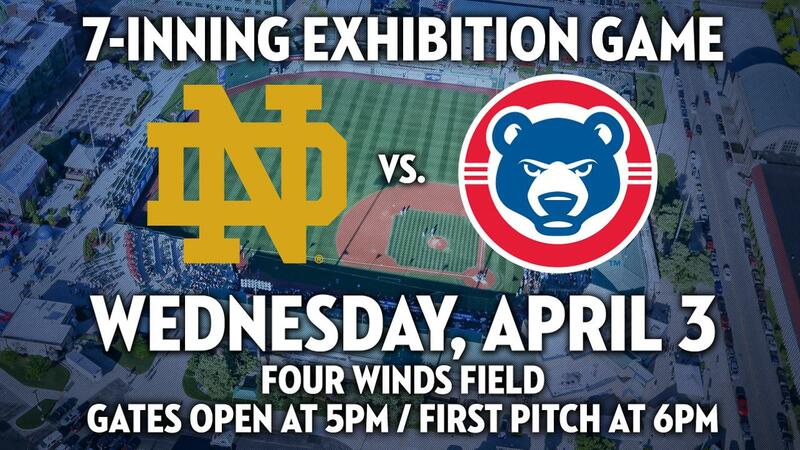 SOUTH BEND, IN - Before Buddy Bailey and the 2019 South Bend Cubs officially take the field for the 2019 Midwest League season, the club will take on the University of Notre Dame baseball team in a 7-inning exhibition game at Four Winds Field on Wednesday, April 3. Admission is just $5 with all proceeds from ticket sales going to charity. "The exhibition game allows our team to get an idea of what it's like to play at Four Winds Field prior to the official first pitch of 2019 being thrown," South Bend Cubs President Joe Hart said. "This game also acts as a full run-through for some of our new gameday staff to make sure everything is perfect for Opening Night." Ticket sales from the game will be split between both teams to a charity of their choice. The Fighting Irish will donate their portion to the Samantha Hickey Foundation, which raises money for Memorial Hospital's Pediatric Cancer Center. The South Bend Cubs charity is the Center for the Homeless. Tickets are $5 and can be purchased at the South Bend Cubs Box Office, by calling (574) 235-9988, or by clicking here. Gates will open at 5:00 p.m. and first pitch for the exhibition is scheduled for 6:00 p.m.